Being a native Portlander, I’ve always had ready access to the coast. 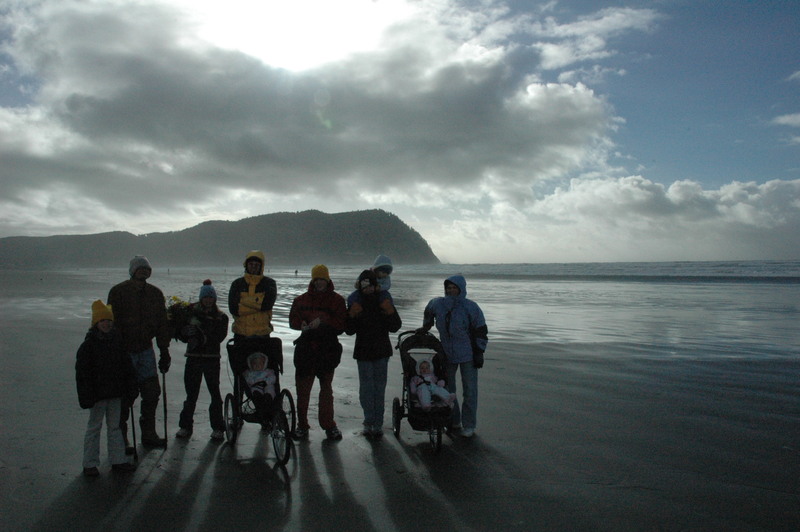 In fact, my family heritage is deeply entrenched in the Oregon Coast. My paternal great-grandparents homesteaded near Waldport in the 1800s and my Dad was born in the log cabin they erected. My maternal great-grandparents owned a general store in Seaside. All my life, we taken regular weekend trips to the coast. Whether camping, in a motel, or staying with family and friends, I can’t remember a time when I’ve not had ready access to the beach. Even after moving away, I seemed to be able to find ways to get to the beach. But those times were further and farther between during my brief sojourn in the high country of Eastern Colorado – or, as we affectionately referred to it, Western Kansas. Two years ago, in the wake of my Mom’s death, my transplanted immediate family traveled to Oregon for her memorial service. Afterward, in respect of her desires, we took her ashes to Seaside and sprinkled them in the surf. It was a cold, surreal day that will live within my memory forever. Though I’ve been on the Oregon Coast since that day, today was the first time I’ve been to Seaside since then. Typical of the North Oregon Coast, it was overcast and windy, but we were blessed with clear visibility and no fog, drizzle, rain, or other forms of atmospheric moisture. In fact, it was a day ver similar to the day we said goodbye to my Mom. My daughter was only a year old the last time I was there. Unsurprisingly, she didn’t remember that day. In fact, she only now knows that there was a Grandma Sharon, but she has no memory of her. My memories of the beach are numerous. There have been campfires, marshmellows, introspection, walking, beachcombing, kites, family, laughter, waves, fishing, sandcastles, running, dogs, treats, windy picnics, and a cacophony of memories that flood through my brain tonight. But today, even after 49+ years of life, today stands out as one of my best experiences on the coast. Today, I saw the beach through the eyes of my three year old daughter. We laughed, we ran, we skipped, we twirled, we waded in the icy cold surf, we jumped waves, we squealed, we cuddled, we built sandcastles, we dug holes, we swung on the swings, we walked the prom, and we left footprints on the sand. It is days like today that make being a parent the absolute coolest thing I’ve ever done in my life. Today, we lived on the edge. Your openness to experiencing this through her eyes is a beautiful thing. I dare say that all of the years of memories would mean much less without sharing this gift with her. There is also perhaps an even greater fulfillment of wishes in this day with your daughter. Thank you for sharing this. I will be subscribing and returning and following. Thanks, Gar. Having experienced some of those beach times with you,m I too have some of those memories. And I miss the beach. I was surprised at how much memories it brought to me about hearing about mom…. Your entry here touched me. As a beach baby myself (spent every weekend possible there growing up) my mother also was a big lover of the sand and surf and all things beach. Since she passed, it’s been bitter-sweet to go there. This weekend we’ll go to Canon Beach and I’m thrilled. Seeing it through my children’s eyes is an amazing experience.